Which stamp came first? "Norlund" or "Genuine Norlund"? Discussion in 'Axe, Tomahawk, & Hatchet Forum' started by GrungeBlud, Aug 8, 2018. It seems strange, and it's a bit of a mystery, but perhaps the Genuine Norlund stamps came first, judging from this ad, supposedly from 1966, which refers to "genuine Norlund". According to YesteryearsTools, Norlund production began in 1968, so they were already advertising "genuine Norlund" before they even began producing them? 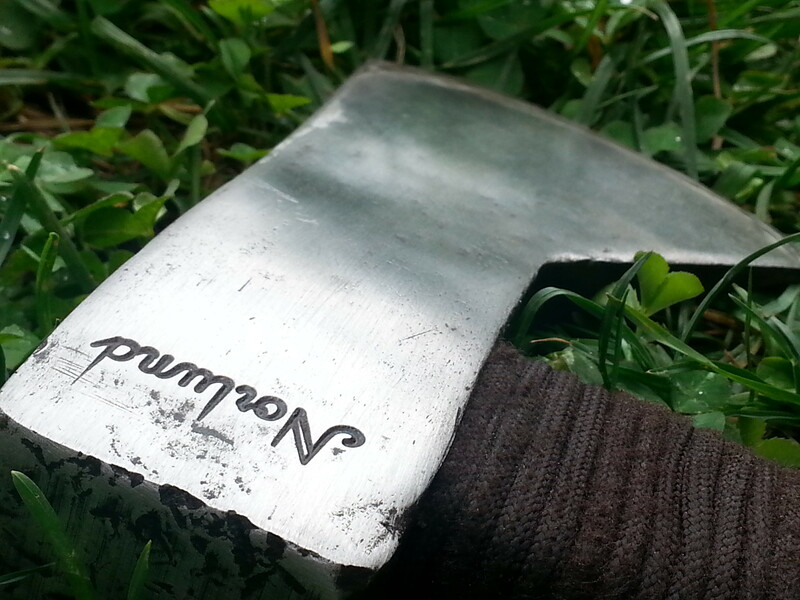 This genuine NORLUND HUDSON BAY AXE has 2Vi lb. head (guaranteed for life), forged from finest steel — is razor sharp. Pole weatherproofed hickory handle (24") for perfect balance. Yankee Josh, Agent_H, GrungeBlud and 1 other person like this. It's strange how the year of advertisement and the year they started production differ from each other. Amazing find there! It's even more strange they would start with "Genuine Norlund" and end (assuming its the last stamp they used) with "Norlund". Very interesting and a big thanks! I figured they added the prefix "genuine" after imitations started to float around or something. I remember reading here on bladeforums on a similar thread that another member thought that would be the case as well. I just love the fact they are from before my time. Dave Canterbury (love him) is the only reason I've heard of these axes. Why are they so special? Is there even a reason besides its age? I've seen older things than any Norlund axe and valued much lower. 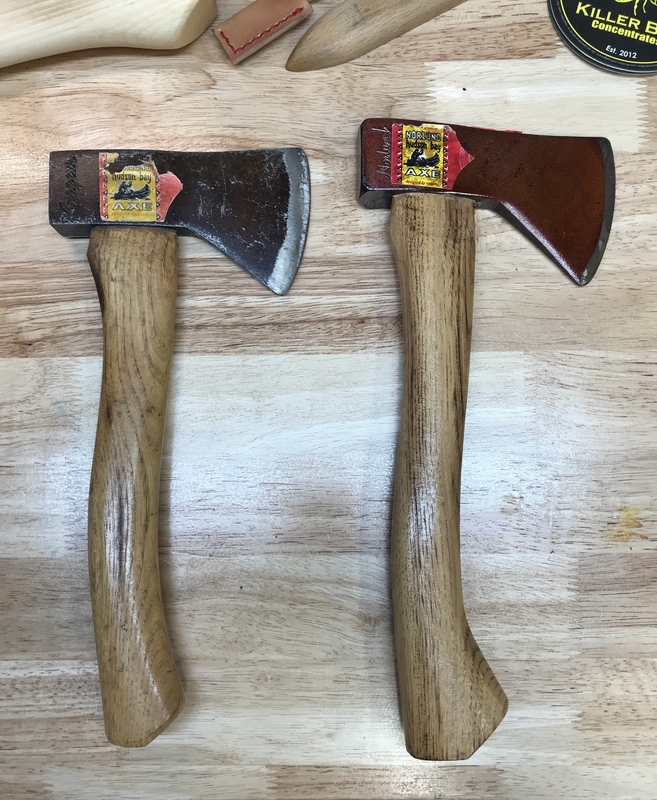 I've read its only nostalgia making these axes worth anything. Hickory n steel likes this. There's no mention of "genuine" in the 1965 ad, so perhaps the earliest ones weren't stamped Genuine, it was added later (in some unknown year), and then the "Genuine" was dropped (in another unknown year) for the most recent ones? Who knows? 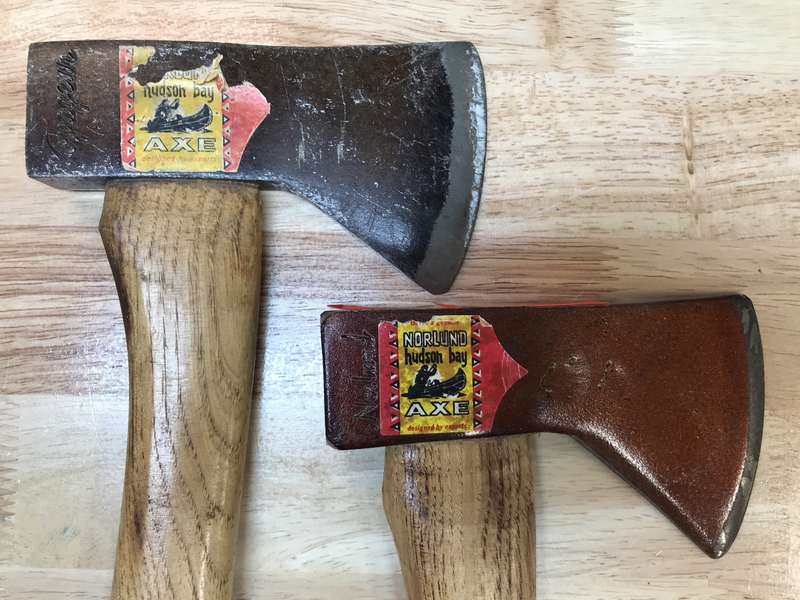 Regarding the premium price that vintage Norlund axes seem to now have, I think it must be something about the brand recognition and perceived backwoods "mystique", plus perhaps some nostalgia of those who heard of them while growing up. Yankee Josh, Agent_H and GrungeBlud like this. Some details from another thread show that the Norlund company existed back around 1910, and Norlund was listed as a division of Mann Edge Tool in 1962. So it's understandable why Mann might want to stamp "Genuine" on the Norlund axes, since the brand was already known. 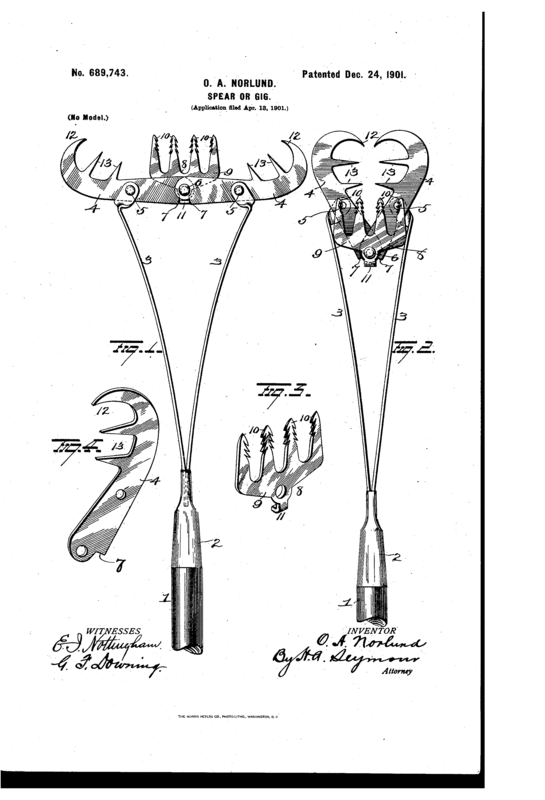 Olof A. Norlund (not Norland), of Williamsport PA, was awarded a patent for a similar gaff in 1901. DIV. MANN EDGE TOOL CO.
A "Hardware Age" listing, reportedly from 1962, shows that O.A. Norlund Co. was a Division of Mann Edge Tool. 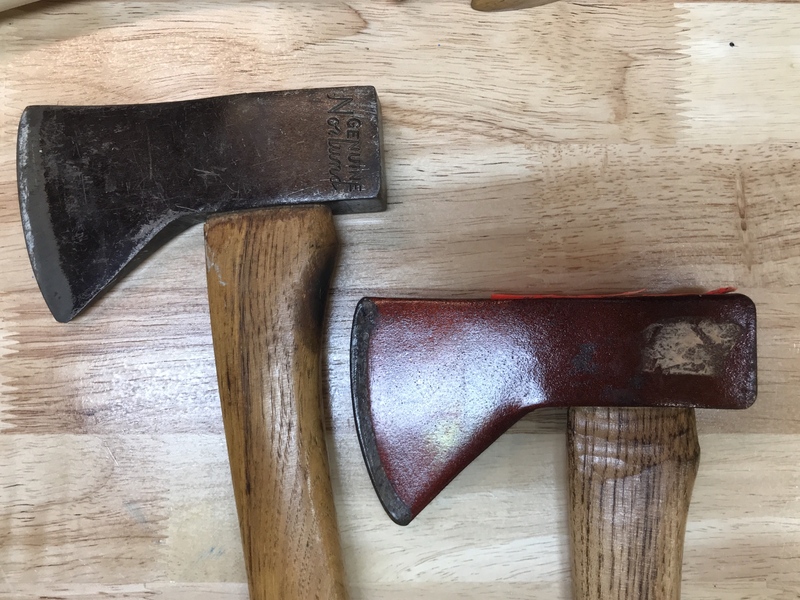 The Canadian trademark information shows that Mann Edge Tool applied for the Norlund's trademark in 1950, and that the trademark was first used in the USA in 1910, and in Canada in 1914 (but axes and hatchets are not listed there in the related goods and services). Yeah, the old Norlund company was abandoned and the old name was picked up for nothing. Interesting thread. Any info on one with a canoe/paddler? Make sure you take Yesteryears Tools info with a grain of salt. Lots of good info but also a lot of misinformation there. The “both stamps” is likely referring to Norlund or Genuine Norlund stamped on one side and the name of the model like Voyageur, Tomahawk, or Saddle Cruiser stamped on the other side. Would a collins hb be the same as a norlund after mann bought them? No, the Collins plant was used for a number of years after Mann bought it. So essentially the Collins axe didn't change at all after the purchase until the original Collins plant was shut down. Here are two NOS Voyageurs. The older one is on the left and has two embossings, “both stamps”, Voyageur and Genuine Norlund. The newer one on the right only has one stamp, Norlund. The older one says Genuine Norlund on the back. The newer one does not have “both stamps”. Nothing on the back of the later one. garry3, Trailsawyer and A17 like this. It was absolutely Norlund. The original Norlund company never used "Genuine" on anything.